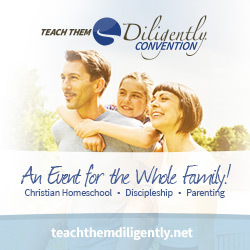 Are any of you going to attend one of the Teach Them Diligently conferences this year? If you register your family early, you can save $10! And if you attend one of the three conferences listed below, I might get to meet you! Our goal as Christian parents is to make disciples of our sons and daughters. God’s Word is a key tool in our discipleship efforts, but we sometimes struggle with how to apply it, how to make it central in our homes, and how to make it relevant to our children. If we merely use Scripture to control, but not to disciple our children, we risk driving them away from the faith. In this workshop I will talk about several key practices that help make the Bible attractive and relevant to your children. 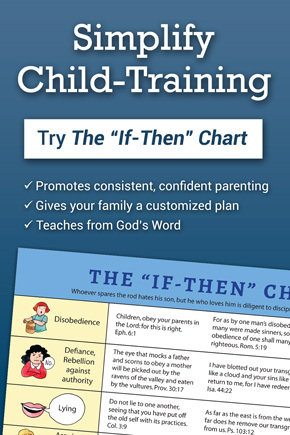 My goal is to suggest simple, practical things you can do to raise up children who love God and His Word! 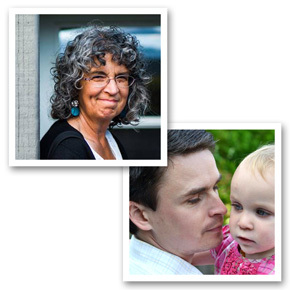 How we live as parents has a tremendous impact on our children, often more than we realize. We should be continually looking to our heavenly Father as the perfect example of a wise and loving parent. I’ll be talking about how my parents’ imperfect faithfulness profoundly influenced my life, and how you can have a positive impact on your children by reflecting the character of our heavenly Father. Now that our six children are all grown up, graduated, and getting married, I can see some of my mistakes more clearly. I hope you will be encouraged in your own parenting as you learn from a few of the lessons God has taught me after thirty years of parenting. My goal is to broaden your perspective, help you discover blind spots, and see how God works even to redeem our mistakes. Calling romance “courtship” or suffocating it with rules does not guarantee a positive experience, as some are discovering. There is no one right “method” that ensures success and happiness, but God has established principles that we are wise to observe. As the thankful mother of five happily married children, I’ve been through five wildly different courtship scenarios. I would like to share some surprising and encouraging stories with you, with the prayer that they will help you prepare your children for romance and make courtship a positive experience for them. You can register here and save $10 on a full family registration (if you’re going to Nashville, do it today to get the discount). If you attend one of these conferences, please stop by Doorposts’ booth and say hello! I’d love to meet you! Also, for those of you who live in the areas where the conferences are being held, I would love to know what you would consider one must-see attraction near the conference venue. We won’t have a car, and we won’t have much time, but it would be fun to see something! Schermerhorn Symphny Center offers a free tour on Wednesdays and Saturdays, I believe (http://www.nashvillesymphony.org/about/tour). It’s a modern structure build on old principles that is very well done. Closest I’ve come to a European symphony hall. Downtown Nashville. Of course, Nashville means country music, so I would be remiss if I didn’t mention the Country Music Hall of Fame and (especially) Studio B and the Ryman Auditorium, home of the Grand Ole Opry for many, many years (but you need one of the tour guides who has been there for a very LNG time to get a really good tour. If you decide to do this, let me know, and I will give you the name of one who has been there and has stories and doesn’t give the sterile, by-the-new-book tour.) none of these last three that I mentioned is cheap, however. Downtown Nashville. And there is the Opryland Hotel. It is free to go there, and if you park at the Opry Mills Mall, you won’t have to pay for parking. The new Opry House is there, too, and you can tour that. It includes a museum, also. The hotel is a very nice place to spend a little time (and provides great backdrops for photos, if needed), and can actually be very relaxing, with eateries (However, most of the restaurants are not real easy on the pocketbook) with a conservatory, a small village, and even an indoor boat ride. A few minutes from downtown. If you have nice weather and wish to be outside, Centenniel Park provides a nice place to go. The centerpiece of the park is the Parthenon, which offers tours, the climax of which is a huge (hideous, if you ask me) statue of Athena, added in recent years). The Parthenon also has art exhibits. Outside, in the park is a small lake where you can feed ducks, etc. it’s a very nice place to have lunch. Ifmyoumgo, be sure to check out the Japanese Garde, especially if the tulips are in bloom. Long comment, but hopefully helpful! In Dallas, you should visit the Perot Science museum!! You should also visit Klyde Warren park which is across the street from the Dallas Museum of Art (also very nice and now is FREE).